Greg Lawless (MAPH ’03) shares this lovely reflection on his MAPH experience, our own Hilary Strang, and being included in the recently-released print issue of Colloquium magazine. 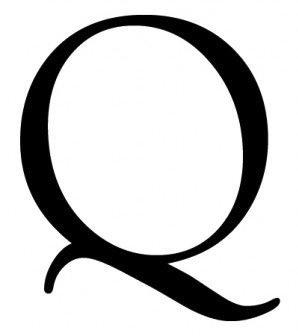 Colloquium collects, as disparately as MAPH itself, a bizarre but beautiful array of contents and people, and manifests something of the original stakes—the desire to know, to write something important, to try to figure IT out—that I so rarely experience these days, through no one’s fault but my own. But, well, I experience IT here, that original excitement, reading this great journal, and being a part of it, and being, in the best and fullest way possible, among my peers. Read more below the cut, and be sure to check out the latest issue of Colloquium released November 7th. You can read Greg’s poetry in Issue 2 of Colloquium, and you can find information on buying his books on his website. 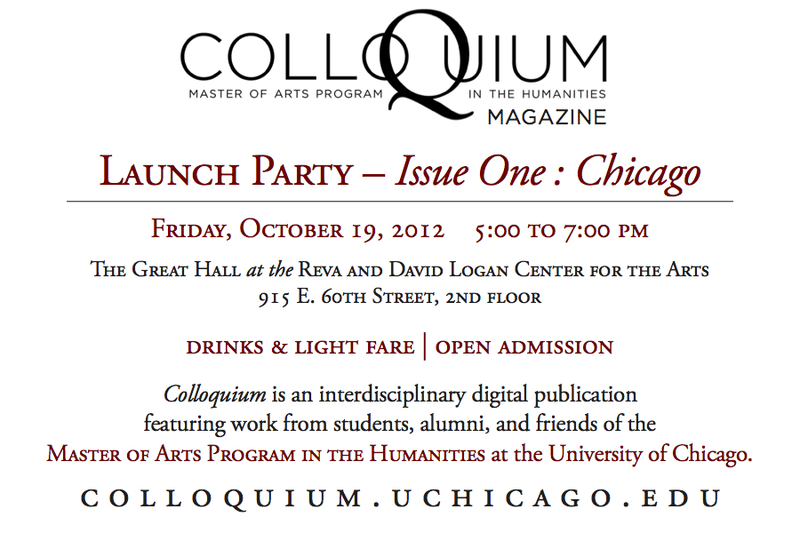 If you are interested in getting your own print copy of Colloquium, email colloquium@uchicago.edu. This entry was posted in - on November 26, 2014 by Sarah. If you have a few minutes today, check out MAPH ’08 alum Kristin Fitzsimmons’ webseries What Did You Look Up on Wikipedia? After graduating from the University of Minnesota’s MFA in Creative Writing Program, my friend Sally and I started a web series called What Did You Look Up on Wikipedia?, an homage to everybody’s favorite light research tool and the many strange tangents it takes you on. Each week, we get together, drink an adult beverage and talk for two hours about what we looked up on Wikipedia. It all gets edited down to 5 or so minutes and posted online. It’s pretty much the most fun unpaid thing we’ve ever done and think it might be right up the alley of students and alums of the University of Chicago. What Did You Look Up on Wikipedia? can be found on YouTube, Facebook, and Twitter. You can also email us with your suggestions of what to look up. This entry was posted in Alumni, Publications and tagged Alumni, Wikipedia on August 15, 2013 by Sarah. This entry was posted in Alumni, Events, On Campus, Publications and tagged Alumni Weekend, Colloquium on June 24, 2013 by Sarah. Today is your last chance to register for Alumni Weekend and see what’s going on inside MAPH’s new journal, Colloquium. 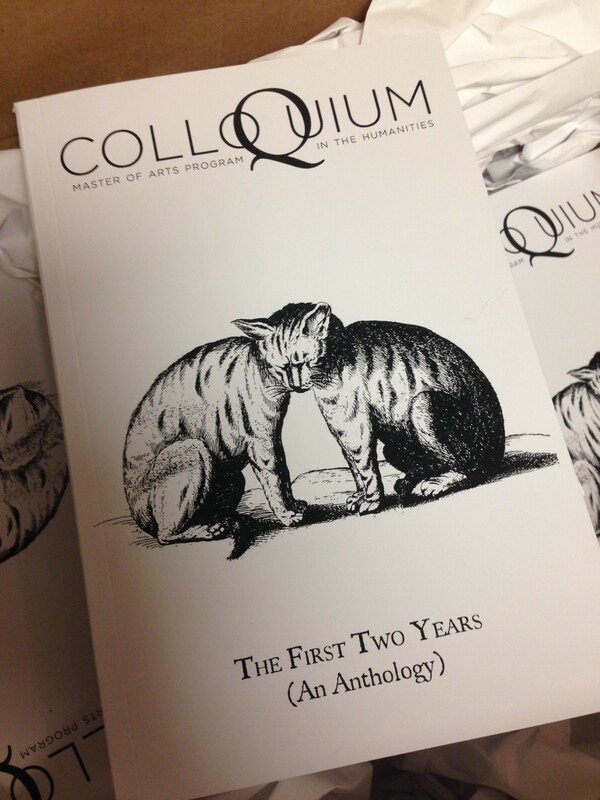 Colloquium is an online journal run entirely and independently by MAPH alumni and current students. We’ll be launching our second issue at MAPH’s Alumni Weekend event, and it’s going to be fantastic. Issue 2.1 has Bauhaus, the Italian avant-garde, rebels and militants, sitars and soundscapes, three poets, short fiction, a cat called Mouloud, and a not-inconsiderable amount of spectroscopy. At the University of Chicago and in MAPH in particular, we joined – for a lifetime – a community of humanists, world-changers, and fierce question-askers. We chase the ineffable and, in one form or another, we chronicle that pursuit. Those chronicles are how we talk together when we can’t talk together. When we founded Colloquium last year, it was to give a home to these chronicles-as-conversations. The only thing better than having all these conversations happening in one online journal is having them face-to-face. Come and experience Colloquium at Alumni Weekend – or better yet, become a part of it. This entry was posted in Alumni, Events, On Campus and tagged Colloquium, Writing on May 31, 2013 by Sarah. Alumni Weekend 2013 is approaching! 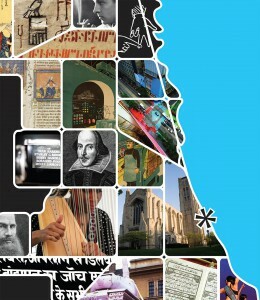 June 6-9, 2013, the University of Chicago will be holding a series of panels, lectures, and social events geared toward alumni. There are a plethora of events being put on by each division so there will be PLENTY to see and do, but we wanted to draw your attention specifically to the event where MAPHers will be making a big showing. UnCommon Core | The Humanities Beyond the Academy: A Colloquium on Colloquium. Our main event! Deputy Director Hilary Strang will be moderating a panel on Colloquium, MAPH’s interdisciplinary online journal. Colloquium‘s editing staff and contributors to the latest issue will be in attendance, and the event will include readings from the latest issue by MAPH students, alumni and friends. What would MAPH be without free food and beer? MAPHers will be making a showing here throughout the duration of the afternoon. Come by and socialize before and after the Colloquium panel. The deadline to register is next Friday, May 31st—but space is already filling up, so the sooner you can register, the better! 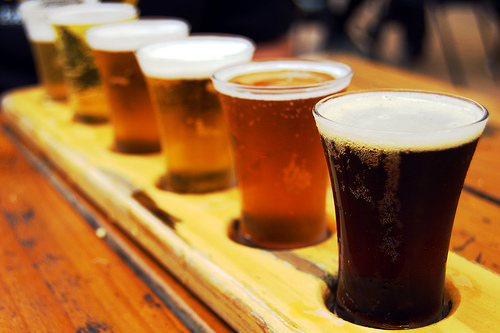 When you register, make sure you specifically check the box for the Colloquium event and the Beer Garden to reserve your space! This entry was posted in Alumni, Events, On Campus, Publications and tagged Alumni Weekend, Colloquium, Reunions on May 24, 2013 by Sarah. MAPHers featured in latest issue of Tableau—twice! The people and projects of MAPH are profiled in two articles in the latest issue of Tableau, the Humanities Division of UChicago’s biyearly magazine. Joanna MacKenzie (AM’02) of Browne & Miller Literary Agency is profiled in the latest issue of Tableau. “Come Together” profiles Colloquium, MAPH’s new online journal that features exemplary, wide-ranging work by MAPH students, alumni and staff. This is not the first mention of Colloquium in other publications—if you’re itching for more meta on the magazine, check out this interview with its founders in The University of Chicago Magazine. The Tableau article has come out just in time for the journal’s second issue, which is set to launch on Friday! Don’t miss it! “Publish and Flourish,” an article on UChicago Humanities alumni who work in the publishing industry, features three MAPH grads who are making it in publishing. Ellen Grafton (AM’11), Allison Wright (AM’08), and Joanna MacKenzie (AM’02) offer their practiced advice on how to get hired and succeed in book publishing. Ellen and Allison moved to New York to get into the business—Ellen is now Assistant Managing Editor of the children’s division at Simon and Schuster, and Allison is the US Dictionaries Editor at Oxford University Press. 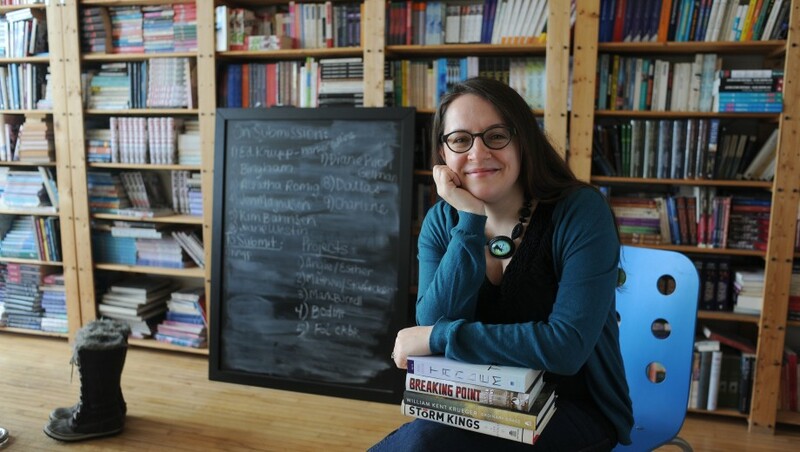 Joanna put down roots in Chicago, and she works as a literary agent at Browne and Miller Literary Associates—the same company where MAPH provides a paid summer internship for one current student every year. Those are just two of the publications that are profiling MAPH alumni and projects. Know of other places MAPH alumni are popping up? Contact us! This entry was posted in News, Publications and tagged Alumni, News, Tableau on May 16, 2013 by Sarah. 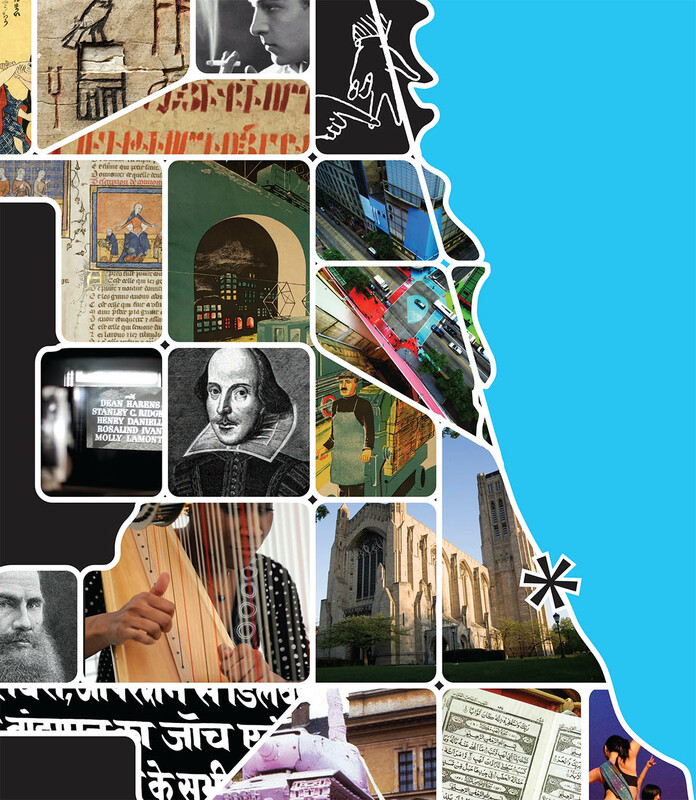 Spring has returned to Chicago, and with it a bounty of new publications by MAPH alumni. 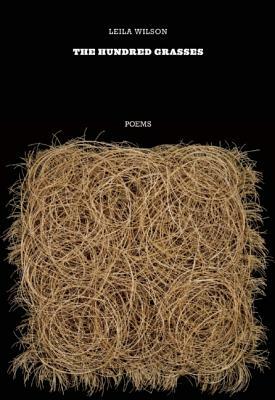 Leila Wilson (AM ’03) and Gregory Lawless (AM ’04) each have a volume of poetry out in which the authors examine their complex relationships with the landscapes of their past and present. Read on for more information in the authors’ own words. My poems are rooted in the flatlands and lowlands: the Midwestern lawns, lakes, fields, and creeks of my childhood, and the Dutch farms, canals, and seascapes near my family’s home in Holland. Much of my poetry focuses on those instances when a space exerts itself beyond recognition, when it seems to estrange itself so that it may be renegotiated. For me this is a process of embedding my examination in the musicality of language and paying close attention to the breath of a line. Leila will be reading from The Hundred Grasses at the Seminary CoOp on 5/21, and at the Chicago Cultural Center on 5/23. 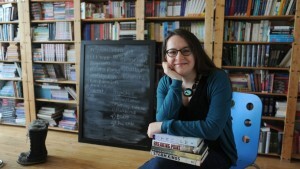 More information about her upcoming readings is available at the publisher’s website. You can purchase The Hundred Grasses from the publisher’s website or from Amazon. 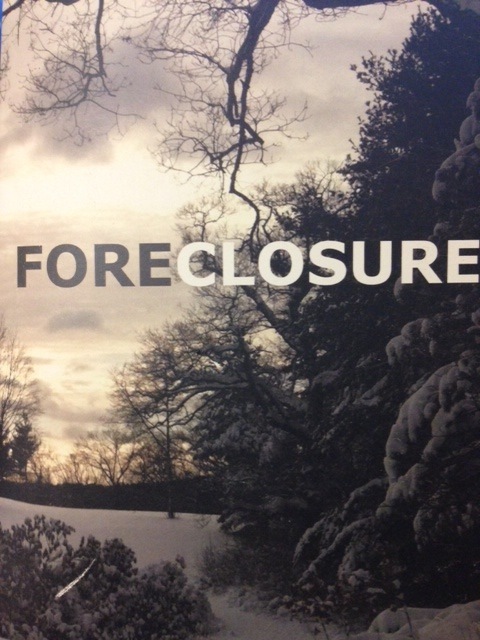 …Foreclosure compares to any book of poetry that hovers nervously in the vicinity of the fraught pastoral, simultaneously wary of and lured by it. Many contemporary pastoral poems regard themselves as anti-pastorals, or post-pastorals—they imagine that the pastoral is impossible because it’s terminally problematic, and, thus, they fret in the wake of that “fact.” The poems in Foreclosure fret differently, I guess—not by abandoning convention or reference altogether, but by manifesting what I call critical ambivalence toward them—at times embracing, and at times rejecting these things, as the poems demand. But ultimately this is a book born of familiarity with a place. You can purchase Foreclosure from the publisher’s website. If you know of other recent publications by MAPH graduates that you think should be profiled, email us! This entry was posted in Alumni, Publications and tagged Alumni, Poetry, Writing on May 3, 2013 by Sarah.